Fee fie foe fum… A giant is causing havoc in Bolton’s historic Albert Halls. 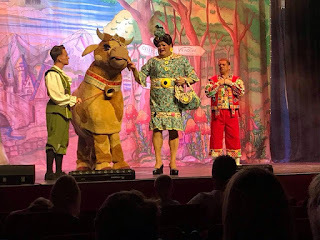 The North East Theatre Guide was on its summer travels and we decided to pop in to see some North West panto action and the good news is that we had a fun time. It is a really imposing building, a short walk from the NCP Octagon Car Park which offers free parking on Saturdays and Sundays. Once inside it is a bit of a maze to find the way to the theatre itself. We were wandering around the floor above the one in which we picked up our tickets, before trying the floor above and finding the correct part of the venue. Perhaps this Spinal Tap moment could be avoided with some clear signage. Once inside we found the seats comfy enough and plenty of leg room. The website suggests it is 670 capacity and it has some tiering to the seating so we had a clear view midway back in the theatre which was good. Room wise, it reminded us in its impressive style to Hull City Hall (without that venues balcony) and shares its acoustic quality. Enough of the venue…what about the show? First on stage is South Shield’s very own panto regular Stephen Sullivan reprising his role as Fleshcreep. Stephen seems to revel in the role of the panto baddie. Indeed, at the interval it was clear that he had got to the children around us. 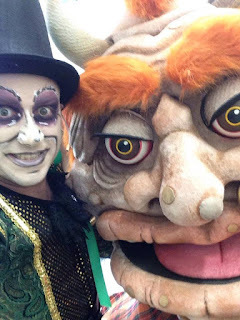 The Ying to his Yang is Anne Nolan as the Fairy Queen. Between them they set up the story, using clever rhyme, for those unfamiliar with the tale, which given that most of the audience are under 8 is probably a good idea. A giant has built his castle high above Boltonia and his henchman Fleshcreep pops down to pick up his next tasty meal. Fleshcreep cons the beautiful Princess Jill (Rebecca Lake) and kidnaps her. Her father the King (Warren Donnelly) offers a reward for her safe return. Meanwhile poor Dame Trott (Richard Aucott) is struggling to raise her two children, Silly Billy (Gary Morrison) and our hero Jack (Andrew Curphey). Gary Morrison and Richard Aucott work well together as comic and panto dame. They get the audience on side and lead one of the early songs In The Dairy to the tune of In The Navy. They work a nice comedy routine with Daisy the cow which had the little ones around us laughing. 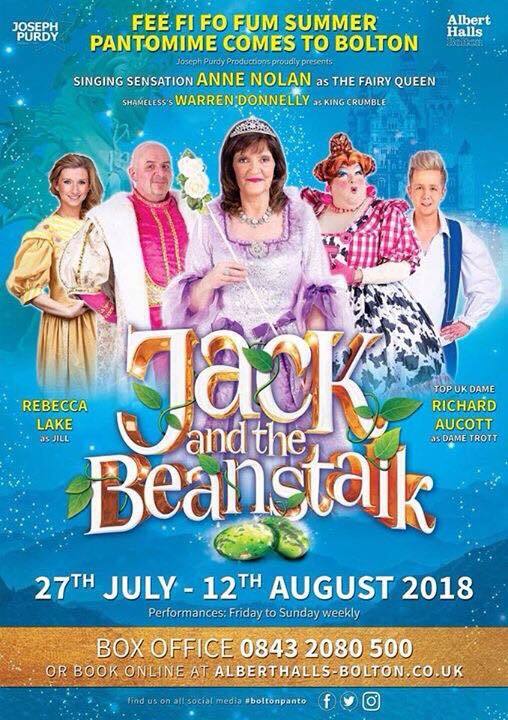 Now we see a lot of panto over the year (Oh, yes we do!) 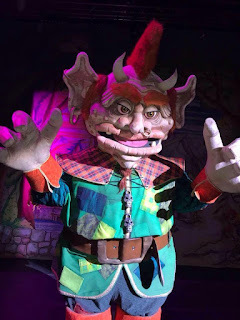 and some shows are aimed at older audiences, and forget the younger kids, whilst some shows recognise that these shows are an important entry point into theatre for many young people. One couple behind us was discussing in the interval how their child (who must have been under 10) wants to go into drama when she is older. This show is both very safe and entertaining for the youngest members of the audience. The young lad in front of us, who was fidgeting in the 10 minutes before the show, was totally captivated by the action on stage for the 2 hour show – no mean feat with such a young audience. 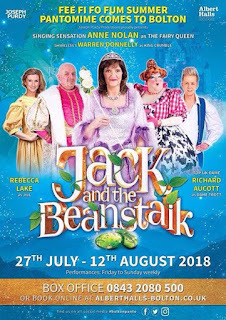 The young audience needs a little training with the mechanics of a panto (“Hi, when I come on I want you to…”) and the cast brought the audience into the action – and that doesn’t happen at every panto either. This panto is sparkly and glamourous too. The sets sparkle, the Princess beautiful, and the giant suitably hideous. Which, as the Princess sings to help the giant sleep, brings us to the music. The songs bridged the generations. The young girls near us were singing along to Rebecca Lake’s version of One Last Time whilst the parents were joining in with YMCA. Of course, you don’t invite a vocalist with the quality of Anne Nolan along without giving her a couple of songs to show off her power and range, and I thought Climb Ev'ry Mountain was the pick of the bunch. The show concludes with the Nolan’s classic I’m In The Mood For Dancing and Dancing In The Streets which had a number of parents up on their feet. The show has two groups of dancers, some younger dancers and some older dancers. They were well choreographed into many of the musical routines and sketches. Did we get to scream “Its behind you!”? Of course we did, as Warren Donnelly, Gary Morrison and Richard Aucott did a great ‘take off’ sketch. The show gets the proper ending and the Beanstalk comes down (unlike one show last Christmas which was weird). No ‘messy scene’ here but we have community singing as Gary Morrison led 4 youngsters on stage through Old MacDonald Had A Farm. The cast worked hard and the young audience applauded appreciatively at the end. 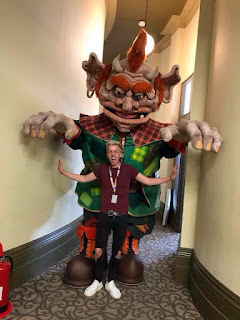 Jack And The Beanstalk is a perfectly fun way to spend a Saturday afternoon in Bolton, especially as it was lashing it down with rain outside!